again, that his account of events is entirely honest. Perhaps, Tommy will say: Hey, I was sixteen. I was scared. The police started to ask me questions. I was afraid that they would think I'd done this. I was also feeling guilty. Maybe, I feared, Martha was being punished because of me. I should have walked her home, and I didn't. She was Michael's girl...the whole thing was wrong. I knew it was wrong, I know it was wrong, but I was afraid to tell the truth. I was afraid to tell my father, to tell Martha's mother. As explanation, such an excuse is entirely plausible and understandable. However, we must then examine whether or not Tommy's subsequent behavior is consistent with such an explanation. Subsequent to the murder of Martha Moxley, did his behavior and demeanor reflect that of a scared young man whose desire to cooperate with authorities was superseded by a paralyzing guilt? 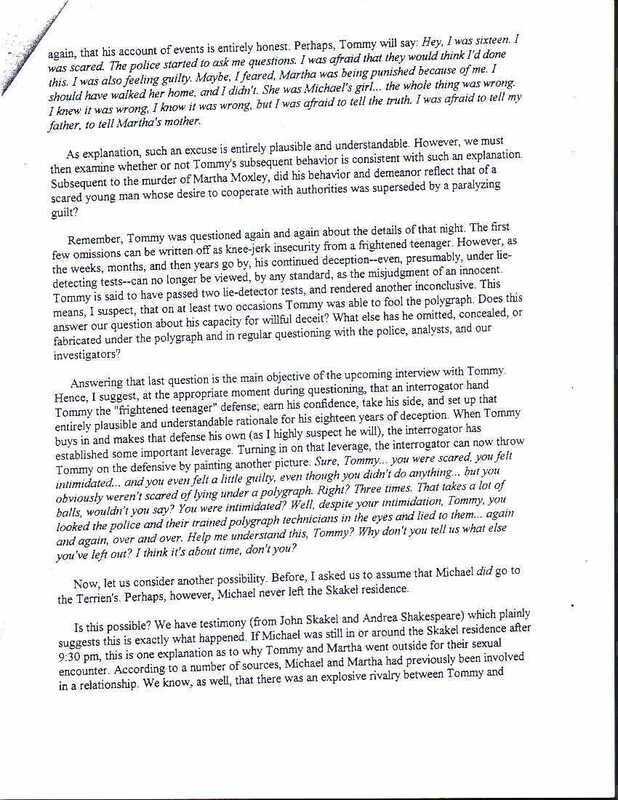 Remember, Tommy was questioned again and again about the details of that night. The first few omissions can be written off as knee-jerk insecurity from a frightened teenager. However, as the weeks, months, and then years go by, his continued deception--even, presumably, under lie-detecting tests--can no longer be viewed, by any standard, as the misjudgment of an innocent. Tommy is said to have passed two lie detector tests, and rendered another inconclusive. This means, I suspect, that on at least two occasions Tommy was able to fool the polygraph.Does this answer our question about his capacity for willful deceit? What else has he omitted, concealed, or fabricated under the polygraph and in regular questioning with the police, analysts, and our investigators? Answering that last question is the main objective of the upcoming interview with Tommy. Hence, I suggest, at the appropriate moment during questioning, that an interrogator hand Tommy the "frightened teenager" defense, earn his confidence, take his side, and set up that entirely plausible and understandable rationale for his eighteen years of deception. When Tommy buys in and makes that defense his own (as I highly suspect he will), the interrogator has established some important leverage. Turning in on that leverage, the interrogator can now throw Tommy on the defensive by painting another picture. Sure, Tommy...you were scared, you felt intimidated...and you even felt a little guilty, even though you didn't do anything... but you obviously weren't scared of lying under a polygraph. Right? Three times. That take a lot of balls, wouldn't you say? You were intimidated? Well, despite your intimidation, Tommy, you looked the police and their trained polygraph technicians in the eyes and lied to them...again and again, over and over. Help me understand this, Tommy? Why don't you tells us what else you've left out? I think it's about time, don't you? Now, let us consider another possibility. Before, I asked us to assume that Michael did go to the Terrien's [Terriens']. Perhaps, however, Michael never left the Skakel residence.